Researchers at the Pacific Northwest National Laboratory were key contributors to the third National Climate Assessment (NCA) report, released May 6, 2014. Through their science, expertise and leadership these researchers provided scientific support to prepare the nation facing uncertainties around climate change. The report is an assessment of the U.S. climate, integrating and analyzing the best science and information from U.S. agencies, institutes, national laboratories, and universities to understand the implications of climate and global change. "The report is vital to inform those who manage and care about U.S. national resources and infrastructure," said Dr. Richard Moss, PNNL scientist and a member of the NCA's Executive Secretariat. "The NCA provides a periodic update of the state of the climate and provides essential science information and guidance for all U.S. sectors, regions and networks that are managing the current impacts of climate change or working on long-term planning for future climate change." The NCA is mandated by Congress as part of the U.S. Global Change Research Program (USGCRP). The report provides an assessment and focused information regarding the best knowledge to date on the effects of human interactions and natural systems on climate change. The information is relevant to the U.S. national interests concerning national resources, ecosystems, land use and infrastructure. The report provides a science basis, targeted analysis and information important for all relevant stakeholders: managers, leaders and policy-makers trying to make long-term plans to prepare the nation for climate change. This is the third report since 2000, a new snapshot of the increasingly large body of science focused specifically on impacts and adaptation options in the United States. The report includes recommendations for improving the flow of scientific information to users in the future through a sustained assessment process. Recognizing that no one agency, government or organization can carry the weight of such a large endeavor, the recommendations for sustained assessment focus on developing the knowledge, information and decision support tools commonly needed by communities and others across the country. This new design enables a bottom-up flow of information by providing the resources and technical support for agencies, interest groups and regional decision-makers to evaluate the potential implications of climate change for their own situations, taking into consideration regional circumstances and planning goals. 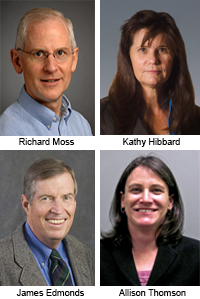 PNNL contributors included Dr. Richard Moss, a member of the NCA Advisory Committee and one of ten members of the Executive Secretariat. Moss was also a convening lead author for the chapter on decision support and prepared scenarios and other guidance materials for authors. Dr. Kathy Hibbard was the coordinating lead author of the NCA's cross-cutting chapter on water, energy, and land. Drs. Kate Calvin and Jae Edmonds were lead and contributing authors of the chapter on mitigation. Dr. Allison Thomson was lead author on the land use land cover change chapter. Dr. R. César Izaurralde, retired, was lead author of the chapter on agriculture and Alison Delgado, currently serving as NCA scientist and sector coordinator with the USGCRP. Several additional staff played key support roles working directly for the USGCRP, supporting writing teams and the review process. Congratulations to the many PNNL scientists who have helped produce this important report. It will serve to shape sound policies, inform public opinion, and advance understanding of the challenges and complexities of climate change. Richard Moss is a scientist working at the Joint Global Change Research Institute, a partnership between PNNL and the University of Maryland. He serves on the Executive Secretariat of the National Climate Assessment Development and Advisory Committee, under whose auspices this report was prepared. He also chairs the National Academy of Science Board on Environmental Change and Society. Moss is a Fellow of the American Association for the Advancement of Science and the Aldo Leopold Leadership Program. Moss has been a lead author and editor of dozens of assessments, reports, and research papers. Kathy Hibbard is an ecologist and carbon cycle scientist at PNNL. She is internationally recognized for her expertise concerning the consequences of human activities on the climate system. Hibbard holds a Ph.D. in Rangeland Ecology and Management from Texas A&M University and has over 30 peer-reviewed journal articles, reports, and book chapters, and more than 1600 citations since 1991. Jae Edmonds is well known for his contributions to the field of integrated assessment of climate change and the examination of interactions between energy, technology, policy, and the environment. He has contributed to numerous assessments including the NCA and the UN-convened Intergovernmental Panel on Climate Change. During his near 40 years in research and teaching, Edmonds has written or co-written hundreds of publications and presentations. Allison Thomson's research explores alternative future scenarios of land management and the implications for the carbon cycle and food security. She has broad expertise in global scale land-use change modeling and analysis with an integrated science point of view. With over 50 publications, she has a broad perspective on the human-environment system interactions through land management and agriculture, and on land-use decisions and interactions with energy and water resources. Kate Calvin is a research economist who, through model development and scenario analysis, researches the influence of bioenergy on land-use, the impact of climate change on agricultural production and the implications of delayed participation in climate stabilization scenarios.